Fender Standard Stratocaster Plus Top, Tobacco Sunburst This strat offers classic Fender tone and styling as you'd expect from any of their .. This strat offers classic Fender tone and styling as you'd expect from any of their Standard Stratocasters, but with added elegance of a flame maple top on the alder body. Equally delightful to play and look at! With the Standard Stratocaster Plus Top, you get all the hallmark features of an iconic guitar. A fast-action maple neck, a comfort-contoured alder body, three single-coil pickups, and standard synchronized tremolo all help define the savage rock tone of a Standard Stratocaster. Modern touches include shielded body cavities help to reduce hum and ensure quieter operation. Few guitars carry the same prestige and rich history as the Stratocaster - since 1954, the Fender Stratocaster has become an icon of modern music. 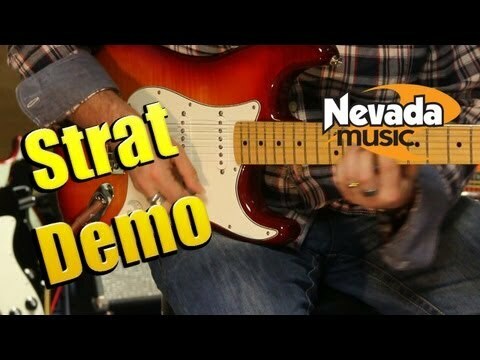 Certified by legends like Jimi Hendrix, Eric Clapton, Mark Knopfler and Yngwie Malmsteen (plus countless others), the Strat is the one of the most exciting shredding machines ever made. The Plus Top Standard Stratocaster is every bit a classic Strat, but with a gorgeous figured maple top. A real stunner, and surprisingly affordable.